You get ALL of our T-Bucket plan sets in one money-saving package that will save you untold time, money, mistakes and frustration. Not only will you become a T-Bucket building expert, but you’ll get loads of incredible inspirational ideas for your own custom T-Bucket build by mixing and matching just the elements you want in your own hot rod. That’s over 450 pages, with 500+ photos, illustrations, diagrams and templates for building just the T-Bucket that suits your particular vision! And save over 25% with this incredible package download. If you’re a true T-Bucket lover, if you’re planning to build a T-Bucket or if you’re thinking about buying a T-Bucket and want to be an informed buyer who knows what he’s bargaining for, the T-Bucket Master Plans Digital Downloads Package is what you need. (No, we don’t have hard copies available). Download ALL FIVE plan sets in the comprehensive T-Bucket Master Plans Package. You get ALL of our T-Bucket plan sets in one money-saving package that will save you untold time, money, mistakes and frustration. Not only will you become a T-Bucket building expert, but you’ll get loads of incredible inspirational ideas for your own custom T-Bucket build by mixing and matching just the elements you want in your own hot rod. 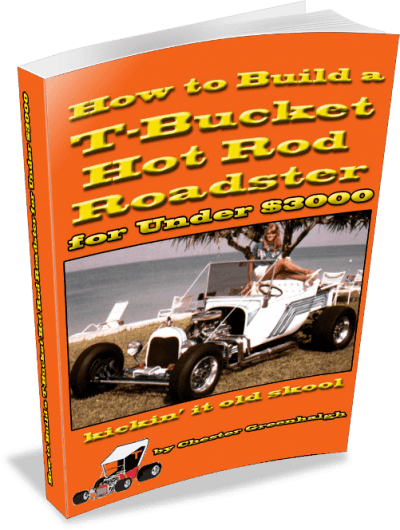 That’s over 450 pages, with 500+ photos, illustrations, diagrams and templates for building just the T-Bucket that suits your particular vision! What’s even better? You save over 25% when you buy and download these plans as a package! Just click the “Add to Cart” button and get ready to become a T-Bucket building expert.